As you might well know, branched chain amino acids (BCAAs) are what comprise about 35% of muscle tissue. They’re three aminos (leucine, isoleucing, and valine) that are vitally important for muscle protein synthesis. BCAAs are essential amino acids; they cannot be made in the body from other aminos. Therefore, they must be consumed from diet in adequate amounts for muscle building. 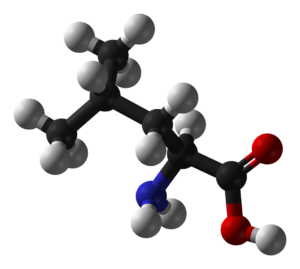 Leucine appears especially important in triggering protein synthesis. It acts in a sort of ignitionary manner for all three aminos to do their protein synthesizing work. Leucine has thus been shown most optimally effective in BCAA supplements at a ratio of 2:1:1 relative to the other two aminos. HMB is short for beta-hydroxy-beta-methylbutyrate. It is a metabolite of leucine. HMB has been shown in some studies to be anti-catabolic; reducing muscle protein breakdown. Because leucine and HMB have been revealed to affect anabolism and anti-catabolism respectively – via different mechanisms – it’s been hypothesized that they might work especially well taken together. In other words… if we take leucine and HMB “stacked”, we might get a synergistic effect that’s greater than either supplement by itself. I did my self-experiment for a month. As always, I kept meticulous records of my progress in the gym. During that month, I added copious daily amounts of HMB (6 grams) and leucine (4-5 grams) to my already protein rich diet. I added them to my post workout shakes and slammed shots of them with meals. For the money and effort expended, I got zilch… absolutely nothing; not a bit of uptick in my already steady gains. My incremental increase in progress was as usual; Nice… but in no way accelerated by the hefty combination of these two consumable products. I have an idea as to why my high leucine intake didn’t produce noticeable results. It could be because I already consume BCAA-rich foods on a daily basis. Egg whites and whey protein are regular staples in my diet. If someone who doesn’t eat as much animal protein were to hit their system with leucine and/or HMB in high doses throughout the day, he or she might see accelerated recuperation and gains. Also, the fact that I added leucine as a stand-alone product obviously threw my ratio of BCAAs way out of the 2:1:1 pattern. Some people in the sports supplement field would attribute this as the sole reason my experiment didn’t work. But another reason might be the ‘timing’ of my intake. I’m not yet sure that consuming high doses of leucine wouldn’t make ALL the difference when done in its entirety post-workout. That’s where my next experiment comes in. Whereas I used extremely high doses of BCAAs on an empty stomach, pre-workout and made myself sick (pg. 22 of my supplements report), I’ll try it again at post-workout with a 30-grams base of whey protein. I’m completely finished with THAT stuff; convinced finally that it’s not worth the label on its bottle. I’ve used both the ‘free acid’ and ‘mono-hydrated calcium salt’ versions… NOTHING! If you’ve experienced something different using HMB that you can reasonably attribute to something other than placebo effect, please leave your feedback about it below. Supplemental HMB has been used in a number of clinical trials as a treatment for preserving lean body mass in muscle wasting conditions, particularly sarcopenia , and has been studied in clinical trials as an adjunct therapy in conjunction with resistance exercise .